An onboard camera view of a Gambler AG flight courtesy of one of our customers. Welcome to the home of Wright Brothers R/C, offering high-quality, electric R/C parkflyer and glider kits. Our kits are designed to be easy to build and easy to fly. They also are designed to fly using the most affordable micro R/C equipment available to allow newcomers to electric R/C parkflying and gliding an affordable entry point into this exciting and growing hobby. Wright Brothers R/C also now offers wargaming products, and custom engraving and laser cutting services. I hope you enjoy your kits and wargaming products as much as I have enjoyed designing and using them. Thanks again. We have updated our shipping and handling charges. 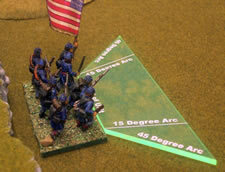 We have added two more products to our miniature wargaming selection -- a Carnage & Glory Firing Template and Custom DBA Rulers. 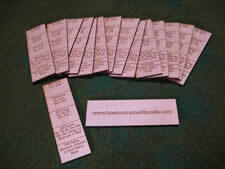 We have added another product to our miniature wargaming selection. We were recently interviewed for a story on MSN Money about people who have turned their hobbies into a small business. WBRC is featured in the new instructional video "A Beginner's Guide to Composite Pod and Boom Fuselages." Curtis Suter discusses the Gambler AG's power pod in a demonstration of how to reinforce a balsa pod. We're happy to announce the availability of products for Allan's other hobby, miniature wargaming. Transform your Gambler-AG into a power plane in mere minutes with the new Gambler AG Power Pod.